The National Board for Respiratory Care (NBRC) offers the Registered Examination for Advanced Level Respiratory Therapists (RRT) for credentialing purposes. Candidates must meet specific academic and clinical experience eligibility requirements before taking this exam, and must receive verification of eligibility by mail before taking the exam. The assessment is in two parts: a written part and a clinical stimulation part. Each part will be completed at different times. If offered, candidates can attempt both parts on the same test day. Candidates that pass both parts receive a Registered Respiratory Therapist (RRT) credential. The written section has 115 test items in multiple-choice format. Of these, 100 are used for the final score, while the remaining 15 are for pre-trial purposes to be used on future exams. The written test lasts two hours, and includes questions about use and scrutiny of patient information, tools and therapeutic procedures. There will be 20 questions on patient data evaluation and recommendation, 18 questions on equipment application and cleanliness, and 62 questions on therapeutic procedure initiation and modification. The other part of the test is the Clinical Stimulation Examination (CSE), which has eleven different patient management issues. Of these, ten are for scoring purposes and one is a pre-trial issue for use on a future exam. Candidates will be given a clinical setting and patient condition in each case. These are as much like real life as possible, and are designed so that they are pertinent to clinical practice in the candidate’s chosen field. The test must be completed in four hours. 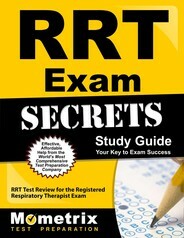 Ace the RRT test using our RRT exam study guide with practice questions. 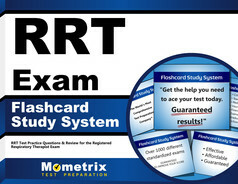 Quickly Solve Difficult RRT Test Questions with the RRT Flashcard Study System.